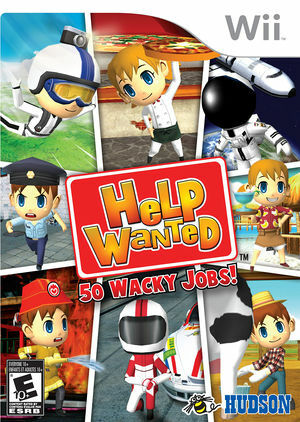 In Help Wanted: 50 Wacky Jobs (aka Job Island: Hard Working People in Europe) the world is in danger. A meteor is plummeting towards earth and the only way to save the planet from destruction is to earn enough money to purchase the anti-meteor gadgets from a TV shopping channel! This bizarre storyline is the basis for Job Island: Hard Working People, a quirky and brilliantly entertaining title featuring 50 mini games that must be finished to earn the money to save the word! However, players must perform better than the other workers in order to succeed. Each of the 50 mini games are in fact jobs players must undertake successfully in order to earn money. These jobs range from the simple to the ridiculous and all make use of the Wii Remote and Nunchuk in ways players would never have thought possible. As a red carpet interviewer for example, the player runs around the celebrity laden carpet waiting for them to give interviews. If you get there first and bag the big star, you earn more money! Managing a BBQ grill players must twist the skewers of meat using the Wii Remote to prevent them from burning and as farmer you must harvest carrots as quickly as possible and also milk a cow! Each job requires skill and concentration to complete and will test all gamers, regardless of their skills. With three levels of difficulty and a multiplayer mode that allows two people to go head to head on any of the jobs that are available in a straight heads-up duel, there is plenty to keep everyone entertained and amused. The graph below charts the compatibility with Help Wanted: 50 Wacky Jobs since Dolphin's 2.0 release, listing revisions only where a compatibility change occurred. This page was last edited on 10 February 2018, at 04:15.